Barney A Very Merry Christmas-the movie arrived on DVD on October 11, 2011. It is 58 minutes, which is perfect for little ones to watch and enjoy. Travel with Barney and Baby Bop to the North Pole and celebrate the Christmas season. You will want to get this movie and help your little ones be ready for the Holidays. You can see more info at Lionsgate and Hit Entertainment. 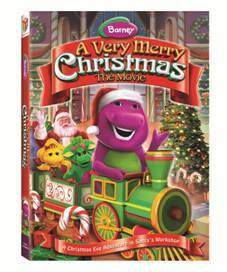 One reader will win Barney: A Very Merry Christmas The Movie DVD! -Leave any comment on this post. Giveaway will end Tuesday, November 8th at midnight MST. Winner will be chosen by Random.org. I was given a DVD to review, no other compensation was received. Email addresses will be deleted after giveaway. If you've won a copy of this DVD in another contest, you are not eligible for this contest. Your privacy is important. US residents only. We would love this thank you! Happy to have found your site! Great Giveaway! Thanks! Barney is so much fun. Thanks for a great giveaway! My brother in law would love this! My kids would love to have this Barney dvd, especially with Christmas just around the corner!